The Nepali Congress (Nepali: नेपाली कांग्रेस; NC) is a social-democratic political party in Nepal. It is the largest opposition party in the House of Representatives and the National Assembly. The party was formed in 1950 by the merger of Nepali National Congress and Nepal Democratic Congress. Nepali Congress prime ministers led four governments between the fall of the Rana dynasty and the start of the Panchayat era, including the first democratically elected government of Nepal in 1959. In the 2017 elections, NC emerged as the second largest party in the House of Representatives, winning 63 out of 275 seats. In 1947, Bishweshwar Prasad Koirala, published an appeal for a unified struggle of Nepali people against the Rana regime. The same year, some Nepalese got together in Benaras and formed an organization by the name All Indian Nepali National Congress (Nepali: अखिल भारतीय नेपाली राष्ट्रिय कांग्रेस) where an ad-hoc committee was established. The initial officers were Devi Prasad Devkota, chairman, Balchandra Sharma, vice-president, Krishna Prasad Bhattarai, general secretary, Gopal Prasad Bhattarai, publicity minister. Its Working Committee included Batuk Prasad Bhattarai, Narayan Prasad Bhattarai and Narendra Regmi. Its coordinator was Bishweshwar Prasad Koirala. Around the same time, Nepalese located in Calcutta formed another organization by the name All Indian Nepali Gorkha Congress (Nepali: अखिल भारतीय गोर्खा कांग्रेस) whose Chairman was Dharma Narayan Pradhan. Koirala traveled extensively to places such as Benaras, Calcutta, Darjeeling, Assam, Bhaksu and Dehradhun and established contact with the Nepalese there. He met with Ganesh Man Singh during the same period. Nepalese representatives from different areas of Nepal and India organized one session in Calcutta. Koirala, Dilli Raman Regmi Dharma Narayan Pradhan and Dhan Man Singh Pariyar were present. In the same session, dropping Akhil Bharatiya from its name, the organization was named Nepali National Congress. Tanka Prasad Acharya, who was facing a life-sentence in Kathmandu, was made its chairman. The flag was square-shaped with white, blue and red colors in succession, with the moon and the sun in its center. Assist the Indians in their Independence movement. Support Vietnam struggling for freedom against French colonization. Ask for the immediate release of imprisoned members of the Praja Parishad. The Nepali Congress Party was formed by the merger of Nepali National Congress and Nepal Democratic Congress. The Nepali National Congress was founded by Matrika Prasad Koirala in Calcutta, India on January 25, 1946. The Nepal Democratic Congress was founded by Subarna Shumsher Rana in Calcutta on August 4, 1948. The two parties merged on April 10, 1950 to form the Nepali Congress and Koirala became its first president. The party called for an armed revolution against the Rana regime. During the Bairgania Conference in Bairgania, Bihar, on September 27, 1950 the Nepali Congress announced an armed revolution against the Rana regime. The president of the party also announced the liquidation of operations in India and that the party would operate only inside Nepal. After King Tribhuvan took refuge inside the Indian Embassy on November 6, 1950. The Congress Liberation Army decided to take this opportunity to launch attacks against the regime before the King "left Nepalese soil". Matrika and Bisheshwor Prasad Koirala and Subarna Shamsher Rana flew to Purnia, Bihar. They called the commanders posted at different locations inside Nepal to prepare for armed strikes near the Nepal-India border. On November 11, 1950, at midnight Birgunj was attacked, and by November 12 it fell to the Nepali Congress and the first "People's Government" was declared. The liberation army was able to control most of the eastern hills of Nepal and the town of Tansen in Palpa. After pressure by the Indian government and the mass movement by the Nepali Congress and other political parties, the Rana government finally submitted to their demands and King Tribhuvan returned to the throne, replacing King Gyanendra, who had been crowned king after King Tribhuvan left for India. After the fall of the Rana government, the Nepali Congress led three of the five governments formed before the elections. Matrika Prasad Koirala, the first commoner to become Prime Minister, led the government from 1951-1952 and 1953-1955 and Subarna Shamsher Rana led the government from 1958-1959. The much delayed elections were finally held in February 1959 and Bishweshwar Prasad Koirala became the first democratically elected Prime Minister of Nepal after the Nepali Congress won 74 of 109 Parliament seats. Following a royal coup by King Mahendra in 1960, many leaders of the party, including Koirala, Rana and General Secretary Hora Prasad Joshi, were imprisoned or exiled; others took political refuge in India. Although political parties were prohibited from 1960 to 1989 and remained outlawed during the panchayat system under the aegis of the Associations and Organizations (Control) Act of 1963, the Nepali Congress persisted. The party placed great emphasis on eliminating the feudal economy and building a basis for socioeconomic development. It proposed nationalizing basic industries and instituting progressive taxes on land, urban housing, salaries, profits and foreign investments. While in exile, the Nepali Congress served as the nucleus around which other opposition groups clustered and instigated popular uprisings in the Hill and Terai regions. During this time, the Nepali Congress refused the overtures of a radical faction of the Communist Party of Nepal for a tactical alliance. Although the Nepali Congress demonstrated endurance, defection, factionalism and external pressures weakened it over time. Nevertheless, it continued to be the only organized party to press for democratization. In the 1980 referendum, it supported the multiparty system in opposition to the panchayat system. In 1981, the party boycotted the Rashtriya Panchayat elections and rejected the new government. The death in 1982 of Bishweshwar Prasad Koirala further weakened the party. Although the party boycotted the 1986 elections to the Rastriya Panchayat, its members were allowed to run in the 1987 local elections. In defiance of the demonstration ban, the Nepali Congress organized mass rallies with the communist factions in January 1990 that ultimately triggered the pro-democracy movement. After the Jana Andolan I, party president Krishna Prasad Bhattarai was invited to form an interim coalition government. 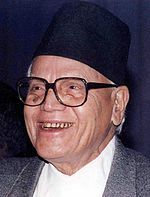 In the elections of 1991, the Nepali Congress won 110 of 205 seats but Bhattarai lost his seat and yielded the position of prime minister to Girija Prasad Koirala who held his seat until 1994. Girija Prasad Koirala again became the Prime Minister in April 1998, leading a Congress minority government after Rastriya Prajatantra and Nepal Sadbhawana quit the government. Eventually, they got support from the CPN (ML) and after their withdrawal the CPN (UML) and Nepal Sadbhawana. During the 1999 elections, Girija Prasad Koirala stepped aside in favour of Krishna Prasad Bhattarai, who returned as Prime Minister when the Nepali Congress won 111 out of 205 House seats. Bhattarai resigned as prime minister on March 16, 2000 after conflicts between himself and supporters of Girija Prasad Koirala. In the party's first open leadership election, the parliamentarians selected Girija Prasad Koirala as their leader by 69-43 votes over Sher Bahadur Deuba. Accordingly, King Birendra designated Girija Prasad Koirala as prime minister on March 20. On August 8, 2000, Koirala dismissed the Minister of Water Resources, Khum Bahadur Khadka, for calling for Koirala’s resignation. Although Koirala beat back another challenge by Deuba’s supporters at a party convention in January 2001, he resigned as Prime Minister on July 19. Deuba then defeated Secretary General Sushil Koirala, 72–40, for the party leadership and was designated prime minister by the king. In May 2002, the party's disciplinary committee expelled Deuba for failing to consult the party before seeking a parliamentary extension of the country’s state of emergency. Deuba’s supporters then expelled Koirala at a general convention in June. Deuba registered his faction as the Nepali Congress (Democratic), following a decision by the Election Commission that the Koirala faction held ownership of the name Nepali Congress, taking 40 of the party's lower house representatives with him. In the months following the King’s October 2002 decisions to dissolve the House of Representatives and replace Prime Minister Deuba with Rastriya Prajatantra’s Lokendra Bahadur Chand, the party joined the CPN (UML) and other, smaller parties in challenging the constitutionality of the moves. The party played a significant role in the formation of the Seven Party Alliance (SPA), which launched a series of street protests against the King's regression. The Seven Party Alliance had earlier avoided the Communist Party of Nepal (Maoist) (CPN-M and their violent methods, signed a 12-point understanding in Delhi in November 2005. The agreement contained three key commitments: the SPA endorsed CPN-M's fundamental demand for elections to a Constituent Assembly; the Maoists reciprocated with an assurance that they accepted a multi-party political system (SPA's prime concern); the SPA and the Maoists agreed to launch a peaceful mass movement against the monarchy. On April 26, 2006, the king reinstated the dissolved parliament and formed a small government under the premiership of Girija Prasad Koirala, the president of the Nepali Congress. In November 2006, the government and the CPN-M signed a Comprehensive Peace Accord in India and the Nepalese Civil War formally ended. On 24 September 2007, the Nepali Congress (Democratic) and Nepali Congress unified as a single party with the Constituent Assembly elections looming. Girija Prasad Koirala remained president of the newly unified party. The party placed second—with 110 out of 575 elected seats—in the April 2008 Constituent Assembly election, winning only half as many seats as CPN-M. The party joined the coalition government headed by Madhav Kumar Nepal in May 2009. Girija Prasad Koirala angered some in the party by nominating his daughter Sujata Koirala to be Foreign Minister. In June, in a contested election for leader of the party’s parliamentary group, Ram Chandra Poudel defeated Deuba. The 12th General Convention of the party was held in Kathmandu from September 17–21, 2010. The convention elected Sushil Koirala as the party president. After the Constituent Assembly of Nepal was dissolved by Prime Minister Baburam Bhattarai after failure to draft a new constitution before the deadline. In the resulting elections, the party emerged as the largest party winning 196 of the 575 elected seats. Along with CPN (UML), under the leadership of Sushil Koirala, they formed a new coalition government. The country's new constitution was promulgated under his leadership on September 20, 2015. Sushil Koirala resigned as prime minister on 10 October 2015 after losing support from CPN (UML). Nepali Congress joined the government again on August 2016, after backing Pushpa Kamal Dahal to become prime minister. According to their agreement, Dahal resigned on May 24, 2017 paving the way for Deuba to become prime minister for a fourth time on June 6, 2017. On 22 April 2017, the Akhanda Nepal Party joined the Nepali Congress ahead of the 2017 Nepalese local elections. Nepali Congress won 11,456 seats including 266 mayoral or chairman positions. The party also won mayor posts in Lalitpur and Biratnagar. Ahead of the 2017 legislative and provincial elections, Nepal Loktantrik Forum led by former Nepali Congress leader, Bijay Kumar Gachhadar merged into the party. The party won 63 seats to the House of Representatives becoming the second largest party. The party could win only 23 seats under first past the post and many influential leaders including Ram Chandra Paudel, Ram Sharan Mahat, Bimalendra Nidhi, Krishna Prasad Sitaula and Arjun Narsingh KC lost in their constituencies. The party won 113 seats in provincial assemblies and became the largest opposition in six out of seven provinces. The party won 13 seats in the 2018 National Assembly election. After the National Assembly elections, Deuba resigned as prime minister on 15 February 2018, paving the way for a new government under CPN (UML). The party's under performance in the elections caused many elements inside the party to call for Deuba's resignation. Prakash Man Singh stood against Deuba for the election of the provincial party leader, but Deuba won the vote 44-19. The party was founded on the principle of democracy and socialism. In 1956 the party adopted democratic socialism as its ideology for socio-economic transformation. Its foreign policy orientation was to nonalignment and good relations with India. As of the 2017 provincial elections, Nepali Congress is the major opposition in all the provinces. Sher Bahadur Deuba: current party president and former Prime Minister. Bishweshwar Prasad Koirala, 1952-1956, 1957-1982. According to the website of Nepali Congress, the following are its sister organizations. Indigenous Nationality Association of Nepal. ^ a b "Central Working Committee". Nepali Congress. Retrieved 19 April 2018. ^ "Contacts". Nepali Congress. Retrieved 8 June 2017. ^ Nepali Congress, An Introduction Archived 2011-02-08 at the Wayback Machine. ^ Sharma, Gopal (6 June 2017). "Nepali Congress leader Deuba elected PM for fourth time". Reuters. Retrieved 12 January 2018. ^ "The Rising Nepal: Nepali Congress In The Opposition". therisingnepal.org.np. Retrieved 2018-03-19. ^ a b www.nepalicongress.org. "NepaliCongress.org- Nepali Congress Official website | Political party of Nepal". www.nepalicongress.org. Retrieved 2017-06-24. ^ Surendra., Bhandari (2014-04-28). Self-determination & constitution making in Nepal : constituent assembly, inclusion, & ethnic federalism. ISBN 9789812870056. OCLC 879347997. ^ a b c "Remembering the revolution". Retrieved 2017-06-24. ^ a b c d e f 1936-, Brass, Paul. R. (Paul Richard) (2013-08-06). Routledge handbook of South Asian politics : India, Pakistan, Bangladesh, Sri Lanka, and Nepal. ISBN 9780415716499. OCLC 843078091. ^ a b c d e f g h i Tom, Lansford (2015-04-22). Political handbook of the world 2015. ISBN 9781483371573. OCLC 912321323. ^ "Nepali Congress split formalised (THT 10 years ago)". The Himalayan Times. 18 June 2012. Retrieved 9 January 2014. ^ UWB (2010-09-23). "Nepali Congress: New Leadership, Old Challenges". United We Blog!. Retrieved 2017-06-25. ^ "Nepal parties resign as constitution deadline passes". BBC News. 2012-05-28. Retrieved 2017-06-25. ^ DPA. "Nepali Congress emerges largest party in parliament". The Hindu. Retrieved 2017-06-25. ^ "Sushil Koirala wins vote to be Nepal's prime minister". BBC News. 2014-02-10. Retrieved 2017-06-25. ^ "Nepal's new constitution endorsed through Constituent Assembly - Xinhua | English.news.cn". news.xinhuanet.com. Retrieved 2017-06-25. ^ "Nepal's Koirala resigns as PM and seeks re-election". www.aljazeera.com. Retrieved 2017-06-25. ^ Sharma, Bhadra (2016-08-03). "Nepal Elects Pushpa Kamal Dahal as New Prime Minister". The New York Times. ISSN 0362-4331. Retrieved 2017-06-25. ^ a b PTI (2017-05-24). "Nepal PM resigns ahead of final round of local elections". The Economic Times. Retrieved 2017-06-25. ^ RASTRIYA SAMACHAR SAMITI (2017-04-22). "Akhanda Nepal Party Samanantar joins Nepali Congress". The Himalayan Times. Retrieved 1 November 2017. ^ "Akhanda Party Nepal unites with Nepali Congress". Inheadline. Retrieved 1 November 2017. ^ "Biratnagar's mayor plans to restore lost glory of the city". My Republica. Retrieved 2018-04-19. ^ "NC wins mayor, deputy mayor in Lalitpur metro". Retrieved 2018-04-19. ^ "Gachhadar's Nepal Loktantrik Forum merges with Nepali Congress". Outlook India. Retrieved 2018-04-19. ^ "Landslide win for Nepal's Reds - Watching The World | The Star Online". www.thestar.com.my. Retrieved 2018-04-19. ^ "Left gets 116 seats as FPTP vote count concludes in Nepal". The New Indian Express. Retrieved 2018-04-19. ^ "NC senior leader Poudel defeated in Tanahun 1". The Himalayan Times. 2017-12-10. Retrieved 2018-04-19. ^ "Nepal's National Assembly gets full shape - Xinhua | English.news.cn". www.xinhuanet.com. Retrieved 2018-04-19. ^ "Nepal PM Sher Bahadur Deuba resigns". The Economic Times. 2018-02-15. Retrieved 2018-04-19. ^ "Deuba 'in no mood' to resign as NC chief". Retrieved 2018-04-19. ^ "Prakash Man Singh: Determined to change party leadership if no improvement – OnlineKhabar". english.onlinekhabar.com. Retrieved 2018-04-19. ^ "NC's voting for PP leader begins". My Republica. Retrieved 2018-04-19. ^ "Deuba elected NC PP leader". Retrieved 2018-04-19. ^ Subho., Basu (2010). Paradise lost? : state failure in Nepal. Lexington Books. ISBN 9780739146644. OCLC 670122356. ^ www.nepalicongress.org. "NepaliCongress.org- Nepali Congress Official website | Political party of Nepal". nepalicongress.org. Retrieved 2017-06-25. This page was last edited on 13 February 2019, at 18:12 (UTC).